It’s only natural after a break-up to want to shake things up a bit. So when salon owner Christi Vreeland parted company with her business partner of four years, she knew it was time to make changes to the Allentown, Pa., salon that had been known as Half Moon Nails. Before venturing out on her own, Vreeland felt it was only fair to redecorate. After all, she explains, half the decor of the original salon really belonged to her former partner. So sometime in the summer of 1996, Half Moon Nails re-emerged as Polish — redone around the theme of the 1940s pin-up girl. “The women in these pictures were all beautiful and very glamorous,” says Vreeland. Redecorating the salon was a labor of love for Vreeland, who approached antique dealers for original ‘40s calendars and memorabilia, and scoured thrift shops for a mix of new and antique furniture. She also repainted the walls, formerly a dark green, with a shiny, lacquer like paint — a painstaking process, she says, but worth the effort. 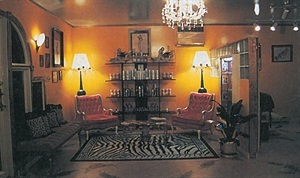 The salon’s clientele has remained largely the same, says Vreeland, but the atmosphere has changed. One new employee, nail technician Elissa Schleder, is an excellent nail artist who handpaints with fine detail, says Vreeland. That area of the business has expanded so that Vreeland estimates 90% of her clients leave with some kind of design on their nails. Another new staffer, Greg Gray, does body piercing in addition to handling receptionist duties, while he earns his permanent license to do nails. Also an indispensable part of the new atmosphere: the background music which favours big band swing and Dean Martin vintage lounge singers.